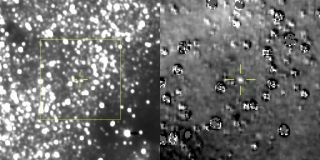 New Horizons scientists stacked 48 different images taken Aug. 16, 2018, to focus on the location of the spacecraft's next target, 2014 MU69 (left). They also subtracted out the stars in the frame to focus on the object itself (right). The New Horizons spacecraft is on its way to a distant solar system object and has spotted its destination — on its first try and from more than 100 million miles (170 million kilometers) away. The spacecraft accomplished that feat on Aug. 16, sending a series of 48 images back to Earth. New Horizons is on its way to fly by a small icy Kuiper Belt object called and nicknamed Ultima Thule. These images, released by NASA yesterday (Aug. 28), show, on the left, the location of the object centered in the crosshairs and, on the right, the same image with stellar brightness subtracted out. "We now have Ultima in our sights from much farther out than once thought possible," Alan Stern, the principal investigator for New Horizons and a planetary scientist at the Southwest Research Institute, said in a NASA statement. "We are on Ultima's doorstep, and an amazing exploration awaits!" Being able to easily spot the object with four months still left in the spacecraft's journey suggests that the team has a good grasp of where exactly 2014 MU69 is and where it's going. This is challenging in and of itself, given that the object was discovered only four years ago and is located 1 billion miles (1.6 billion km) beyond Pluto. And if spotting a tiny hunk of rock from 100 million miles away doesn't sound hard enough, consider the sheer number of stars that are in the same field of view — including one right next to the object, directly to the right and below it in the left-hand image. "It really is like finding a needle in a haystack," Hal Weaver, a New Horizons project scientist at the Johns Hopkins University Applied Physics Laboratory, said in the statement. "In these first images, Ultima appears only as a bump on the side of a background star that's roughly 17 times brighter, but Ultima will be getting brighter — and easier to see — as the spacecraft gets closer." And New Horizons will just keep getting closer until Jan. 1, 2019, when it will make its closest approach to the object.